Leading Manufacturer of vertical inline pump set from Mumbai. Owing to the competency of our technical experts, we are engaged in supplying an extensive range of Vertical Inline Pump Set. Our vendor's dexterous professionals make use of the finest quality components with the help of advanced techniques to manufacture this pump. The provided pump is commonly used in cold and hot water circulation systems in commercial buildings. The offered pump is tested against various parameters of quality before the final dispatch. 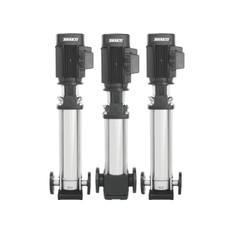 Further, this pump can be availed in diverse specifications at an affordable price.